OK so you guys voted for the USA, with a Australia coming second (so I guess that’ll be the next one). Thanks for your support guys. – Don’t forget the if you want early notification of our Kickstarter campaign submit in the form in the side bar. With the new inclusion of Australia on Kickstarter, I thought it an opportunity not to be missed. I’ll be offering the published game in 3 player, 4 player and 6 players sets, plus some fun extras. When kickstarter is launched in the very, very near future I will have some limited special editions/pledges – and I want you guys to get them! All I need from you is your email so I can let you know the details and the start date of the campaign. Well the 29th has been and gone, and the day worked out quite well. It was probably more of a thank you to everyone involved over the past year than a game launch, but it was great to watch a few first time players experience the game as well. Everyone decided to pair up and play, which created a slightly longer game, but it was fantastic to hear everyone discussing tactics. I managed to wrangle a large format print of the board! 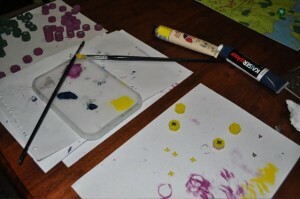 It was nice to play on a high gloss board without seams. I did find the board a little too large, but I suspected as much from a previous game I had played with my brother (a 2 person game). I will write more in an upcoming post about this issue. 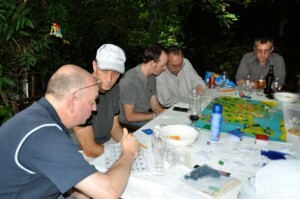 Pete and James making a strategic move! There was some really good discussion afterward, and I now have some great ideas for future versions, and tweaks to the game. I’m going to savor these ideas for later posts, so stay tuned. I also plan to add plenty more content for downloading and customisation in the next 2 weeks. Thank you again to everyone who could make it. I hope you enjoyed the game, and of course, don’t forget to download the game when you get a chance. We recently had another test of the board game. We attempted to play the game through, although we didn’t quite make it after seven hours of play. We did get very close, however, so it did become obvious as to who was most likely to win. What I was really hoping to check during the game was the balance of the unit strengths and weaknesses, and whether they were balanced against the cost, the game stage, and against other units. The other part of our testing was the discovery tree. There were a number of bonuses in there that had not been tested, and I felt we need to examine these as well. 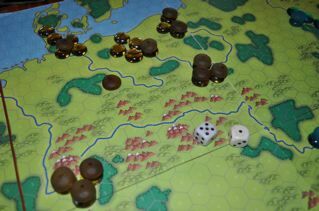 The city in the bottom left was taken more than 10 times during the game, most of the battles never needed a die. Combat is something that is hard to measure without solid play testing. I have created a small program where you can check the numbers of each combat system. I have tried a number of variations, but the format we went with was 1d6 + bonus. The results were interesting, but not exactly what I was after. 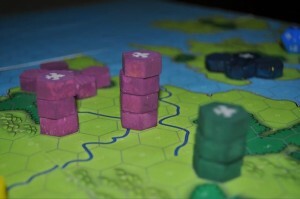 Very quickly players would opt to build large armies that did not require a roll, ensuring victory, rather than taking any chances with rolling. This demonstrated two issues; units were not balanced using the 1d6; and there was no real balance with shadow costs, as a player was not taking any risks for the gain of winning a battle. There needs to be an inherent risk involved with the war strategy, and an equivalent reward. In the game, there are of course three winning strategies, and I would like to make each valid and worthwhile. The game balance is heavily weighed towards expansion; war being the next best strategy, and then technology. These need to be equal, and this test-play demonstrated it’s current flaws. The blue player switched from technology to expansion later in the game and was unmolested due to their position on the map. I have recoginsed some of the issues with the game. One player took the option of fighting everyone, and this stopped other players from continuing their strategy, as they needed to concentrate on their defence. Another player took expansion as their approach, and they quickly exceeded other players in points as they researched many technologies, allowing them to catch up with players who had technology as their approach. Expansion is by far the best option, providing you are well placed on the map and not threatened by other players. Since this test-play, I have given the issue some thought, and I am looking at finding a way to limit expansion as an option and make war and technology more appealing. Technology also gained rewards which were too great. Doubling of points was powerful, and allowed players to jump forward quite dramatically. I think the technology tree can play an important part in balancing, and there are a few approaches I can take. One is to make technology advantages dependent on other activities. A particular form of technology could allow expansions of cities, but only cities greater than four or five. 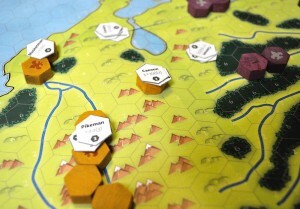 This means the player who avoids expanding cities has a smaller reward from this technology. This forces the player to think more carefully about their tactics long-term. Allowing players to implement various strategies is proving to be a real hurdle, but I think it’s an important aspect to the games’ appeal. 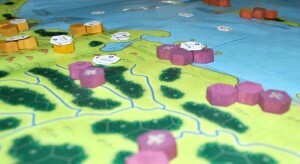 Resources on the board were unbalanced; Spain was easily defended and had plenty of resources. Something that needs some work is resource distribution on the board, and it can really only be worked out through test-play, although a little logic always helps. This was evident in the first test-play and I adjusted it marginally for the next one, however, as it turns out I needed to do more. Spain was by far the strongest position, and Greece the weakest. I have since improved resource placement and have tried to entice players to weaker positions for more points, and stronger positions for less points. The logic here is obvious, but the idea is to have players make a tactical choice on their location based on these two qualities and their chosen playing style. Always give your players ‘interesting choices’. 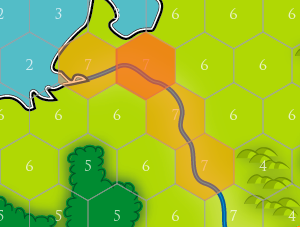 This a new design for the board using the numbers 1-7, they can also be supplemented for the terrain types as used in the original rules. 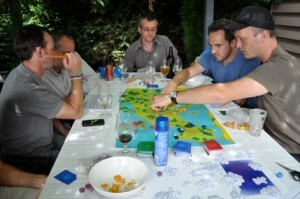 We recently had a board game day, where we played a number of board games. One of the games we played was ‘Sovereign’, and having only played it previously with two players, we managed to discover quite a few new issues with the game. This was great, and the discussion afterward left us with some interesting solutions to these problems. The main issue, however, still remains; the overly complex economic challenges and calculating all the resources. While the balancing of many resources is challenging, it tends to create unwanted amounts of player stress, and moves game-play away from the social interaction, (especially when playing in a large group). This is one of the more appealing features of board games, and I feel it is an issue that must be addressed. When we looked at this problem, the solution was really staring us in the face. We had to find a way to reduce two things; the number of resources; and all the mathematics – the adding up for each turn was taking up too much time. 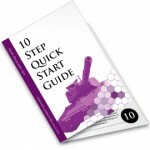 I have listed a solution to this in the spin-off game ideas under combat version. This discussed reducing the number of resources to one, resulting in less adding up, less spending and shortening turn length. 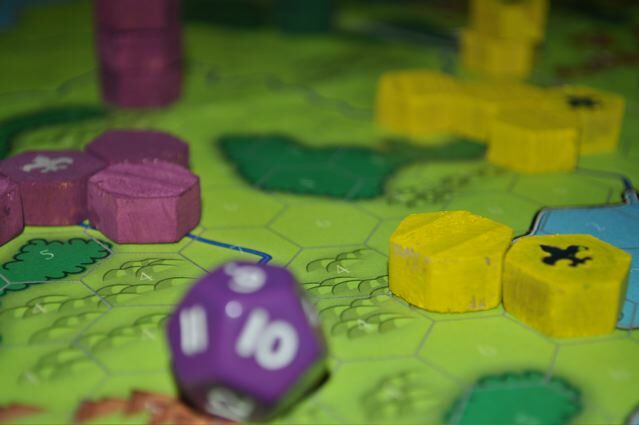 In doing this we had to sacrifice some of the more interesting aspects of the current rules where players strive for a variety of resources, rather than focusing on just one. 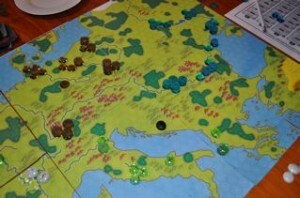 The multiple resources created a situation for the player where they must think a lot more about the rest of their game-play. 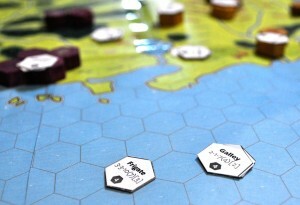 When placing cities, they must consider the strategic locations, while also considering the resources in the tiles they have yet to access. This was part of the reasoning behind the variety of resources in the first place. 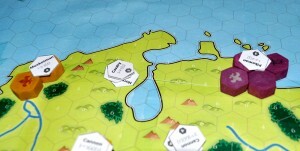 Hexagon map with simplified resources system. Upon review, some investigation, and a little number crunching, we found a way to maintain those aspects, albeit a little less complex. By having a single value between one and seven, players can choose between more strategic tiles and the high scoring tiles. 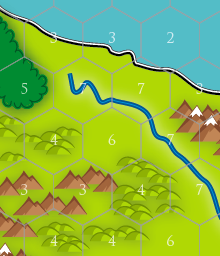 As a general rule seven point tiles, which are located on rivers, are accessible by ships and seldom have natural mountain barriers for protection. Low scoring tiles tend to be located in or around natural defenses, or have a more strategic location. The rules we came up with to govern city capture also help balance choices, by requiring the player to protect the first city tile or risk losing the entire city. Rivers will generally make a long string-like city, and therefore make it harder to defend. There are also advantages in blocking another players’ access to an area by building your city in a choke point on a map. 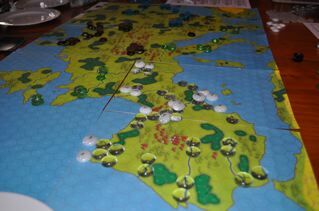 This forces a player to take a city or travel the long way around, effectively buying you time to set up defenses. A hexagon map with the city tiles in orange. The dark orange is the central tile of the city, this needs to be defended in order to hold the entire city. 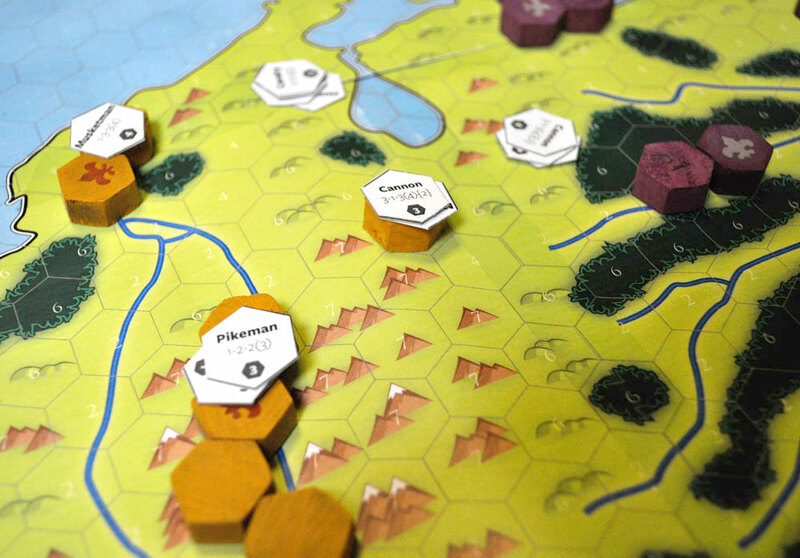 To reduce a typical turn, we decided adding points should be much simpler. 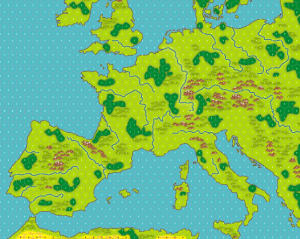 Players would simply add all the points of the tiles that their cities occupy. This will give them an amount that they have to spend in a given turn. We can also remove the accumulation of points, and now players have fewer numbers to remember. The spin-off for this was the added challenge of trying to spend all their points in each turn. These rule changes have allowed a turn to be a lot faster, by adding up your points, spending them, and then moving your playing pieces. I will post the new ‘light’ rules soon, once we have had a chance to test them out.